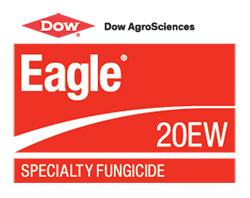 Eagle® 20EW specialty fungicide is the proven choice for curing and preventing more than 15 damaging turf diseases, including brown patch, dollar spot and spring dead spot. It works from the inside out and, unlike other locally systemic products, it protects new foliage by translocating to new growth. Eagle 20EW does not display the plant growth regulator effects often found in similar products — so when applied according to label directions, it will not inhibit the growth or development of turf or ornamentals. For more information, visit the product page for Eagle 20EW.